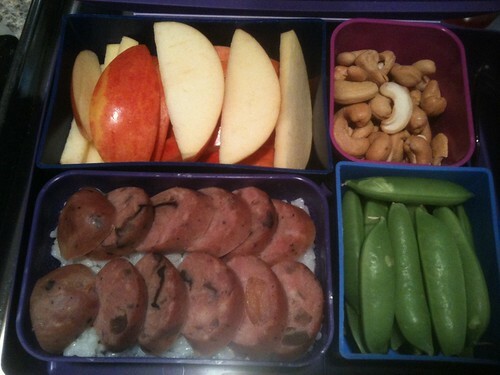 Lunch: Most of an apple (Lady Alice), roasted cashews, sugar snap peas, and portabello-chicken sausage sliced on top of rice. 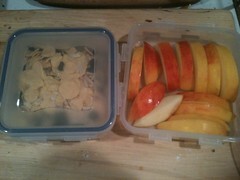 Breakfast, to enjoy on the ferry: Amazon Flakes (Envirokidz—it’s GF/DF/OF), raisins, slivered almonds; and all of an apple. Sweetened vanilla almond milk added to the bottle in the lower right. 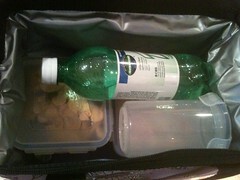 Lunch was mostly self-contained in a Laptop Lunch box, breakfast was not. I have a number of self-contained boxes as well, but cereal with milk is a tough one and tends to only be solved via Lock & Lock containers.